Today was Disneyland: Day 2. We went back to go to the other side of the park, California Adventure. Calvin was very excited since that’s where Cars Land is. On the way in, Calvin got to see Mickey again and give him a big hug. Cars Land is basically an exact recreation of Radiator Springs, the fictional little town from the movie Cars. Throughout our time here, I’ve been continually impressed by the attention to detail on the part of Disney. They really think of every last little thing. But with Radiator Springs, they really outdid themselves. Denise and I were floored at how realistic everything was. And Calvin could barely believe his eyes! As soon as we came in, we saw Red (the fire engine) and Calvin got to take his picture with him which he thought was pretty awesome. For some reason, from the first day to the second day, Calvin developed cold feet regarding rides. I had to practically drag him onto the Luigi tire ride. Afterwards, he said he had fun on it but that didn’t seem to help with getting him onto other rides. For breakfast, we dined at Flo’s V-8 Café. After breakfast, we saw a familiar face in front of the Cozy Cone Motel… it was Mater! I can’t even describe how excited Calvin was! So we all got our picture taken with him. After checking out the rest of Radiator Springs, we passed the Cozy Cone again and there in front was none other than Lightning McQueen! If Calvin was excited to see Mater, this was easily double that. So of course we had to get our picture taken with him, too! Before this trip, we told Calvin he could pick out a Lightning toy for doing a good job with potty training. Since I’m a softie, I caved and bought him a giant Mack with 15 cars inside that he really wanted. It’s his new favorite thing! Right before leaving for our midday break, Denise convinced Calvin to go on a Bug’s Life ride which he also really enjoyed… after the fact. We also did a Bug’s Life 4D which is kind of neat. Denise and I had already done the same thing at Disney World, but you actually get air blown at you, the seat moves when “bugs” are supposedly crawling underneath you, and so on to add another dimension of realism. When we came back, Calvin got to meet Jake from Jake and the Neverland Pirates! As if Calvin didn’t think that was cool enough, Jake grabbed Calvin’s Lightning McQueen car that he was holding and played with it. So now it’s officially been blessed. Afterwards, we went on a Monsters, Inc. ride. Then we went on what we thought was a Muppets 4D thing but to our surprise, it turned out to be a 4D preview for the new Oz movie. That was a little bit scary for Calvin but he made it through it. After that, we caught the Pixar parade which was really awesome. It had elements from all of the Pixar movies. We all loved it. Then we headed towards Radiator Springs again which we were all excited for since, in the movie, it was all lit up with neon at night. It definitely didn’t disappoint! Somehow we managed to get Calvin to go on the Mater tractor ride which is kind of like a Scrambler/Tilt-A-Whirl type thing. He really loved it! In fact, he told us later that it was his favorite part of today. We then went to Paradise Pier, which is a boardwalk-type area, and went on a Little Mermaid ride (Denise’s favorite) and a Toy Story ride. We then finished up rides with a spin or two on the giant Mickey ferris wheel. Even though Calvin was getting pretty tired, it was almost nine o’clock at this point so we decided to stay for the 9:15 water show. It’s a pretty incredible combination of Bellagio-style water jets, colored lights and Disney music from most of their movies. Calvin got really into it and even clapped at the end of most songs. 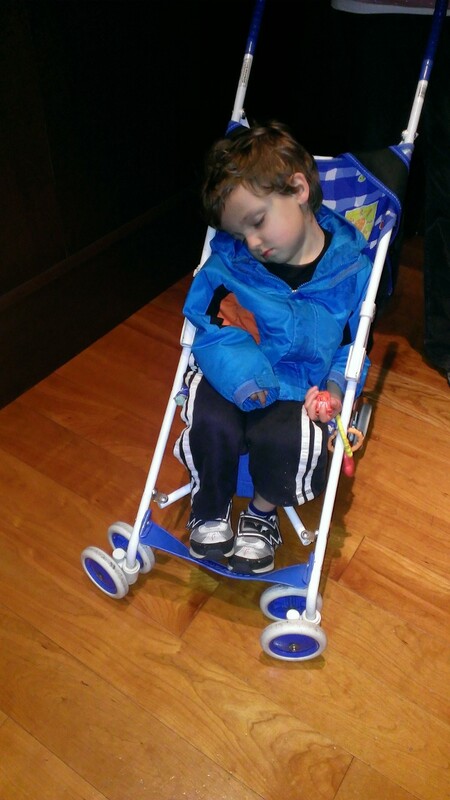 Once again, he didn’t even make it to the park exit before zonking out in his stroller!